From everyone at Scrap Shotz, we wish you and your family a very Merry Christmas and a Happy New Year! Thank you for your friendship and your business - we look forward to seeing more of you in 2014!!! 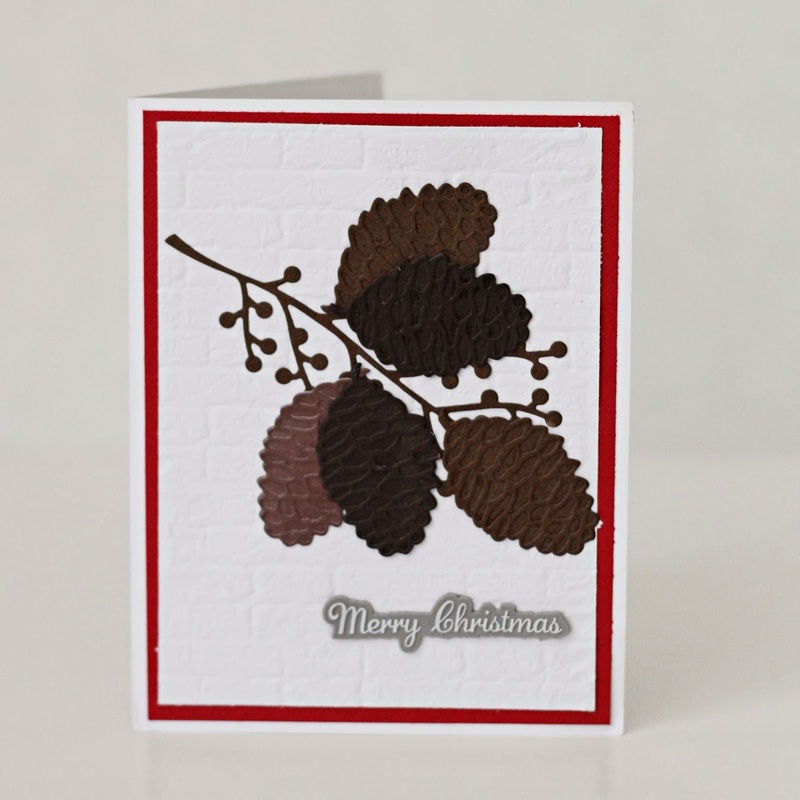 There is still time to make hand crafted cards to the special people in your life. 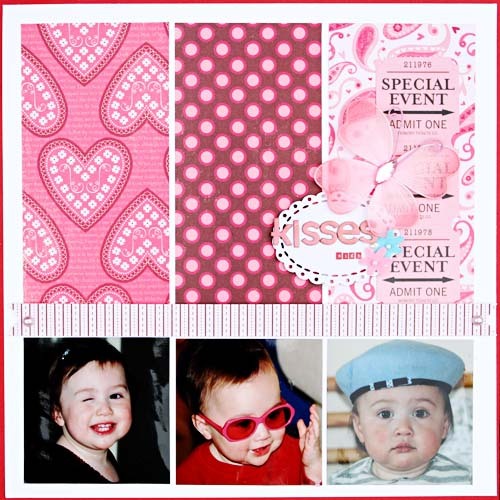 Look at the sample below created by Rosie. These are also perfect for attaching to hostess gifts and teacher gifts - and takes minutes to complete. 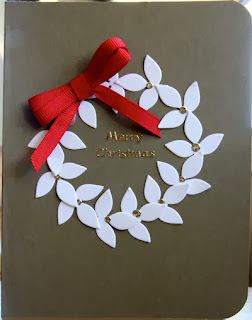 Just layer the die cut leaves into a wreath shape, add a glitter dot to the centre of the leaves, add your sentiment and a ribbon and you are done! This card is gorgeous! How is your December Daily coming along? 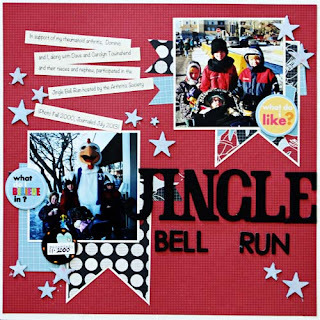 One of Design Team members, Rebecca Hilligas, is also making a December Daily. Check out her beautiful project below. Rebecca's December Daily is created using the Teresa Collins' Santa's List collection pack. (The collection pack can be ordered from Sandy and the accessories can be found here.) 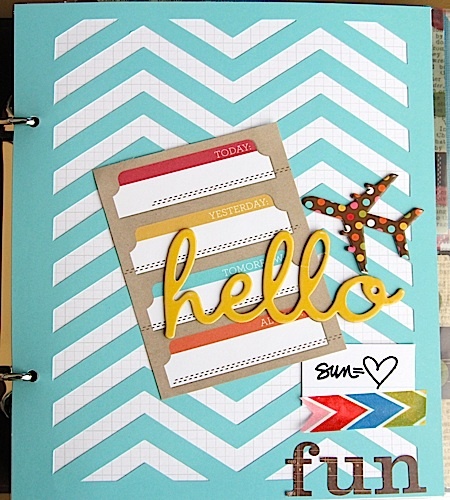 She cut the pages into 6x6 to simplify the project and to utilize the double sized pattern papers to its fullest. Like her cover, she cut the numbers with her Silhouette Cameo. Rebecca added some special items by cutting 2 sheets of transparencies to create a shaker pocket filled with sequins and punched stars. Rebecca used the Bind-it-all to assemble the book. 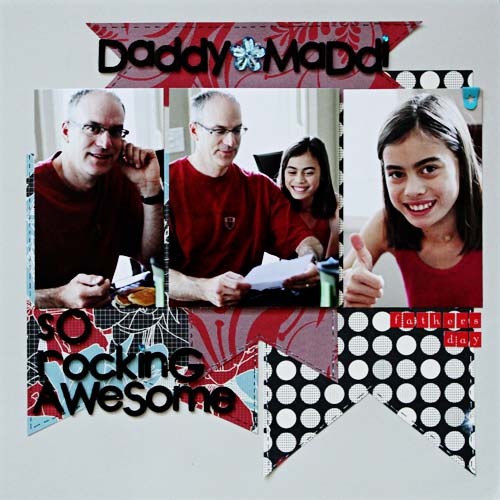 (The Bind-it-all is a specialty item that is ordered directly from Sandy.) Rebecca is also going to be using her WRMK 3x4 punch to insert her photos and journalling. I think you will agree that this is a beautiful project....and is very inspiring! 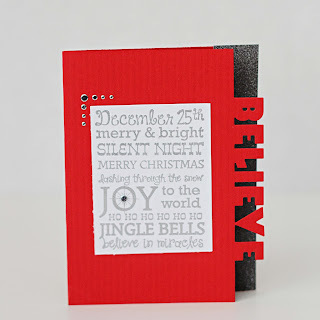 At Scrap Shotz it has become an almost tradition to have a month of inspiration as we head into the Christmas season. I show you some quick and easy last minute gifts or home decor items or something to dress your table with and even gift ideas (that maybe you want to see under the tree this year) - you never know what you will see here! So let's start off the first few days with our December Daily!!! For this year, I wanted to be simple, easy and something my children could participate in. 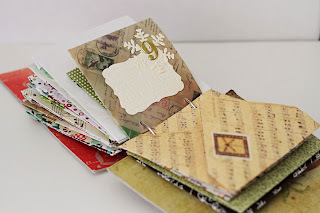 I used the WRMK Envelope Board to create 31 envelopes of varying sizes, using up my Christmas stash or any paper that had red, green, white, blue, gold, silver (well any matching colours!) - and wow, did it ever make a dent in my stash!! 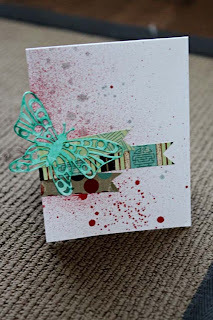 I also used the Spellbinders dies to create a label on each envelope that I embossed with the Tim Holtz embossing folders (wood grain and brick wall). Adorning each label is a die cut snowflake and the uber cool December Daily thickers from Studio Calico --- seriously one of my favorite items this year! My daughters and I will be journalling each day using the journal cards from Simple Stories, American Crafts and Smash Books. Each girl will be using the American Crafts Project Life pens because we just adore them....I mean we really really love them! (I use them just for writing everyday because I love them SO much!) I have taken a picture each day and will print them off and put them into each envelope with a corresponding journal card. It is a fun activity I do with my girls each day...well, in reality, it is every 2-3 days. How is your December Daily faring? I would love to hear! Join me on the blog as I work to inspire you and/or spread some Christmas cheer throughout the month of December! Are you looking for an amazing product that is unique and versatile? 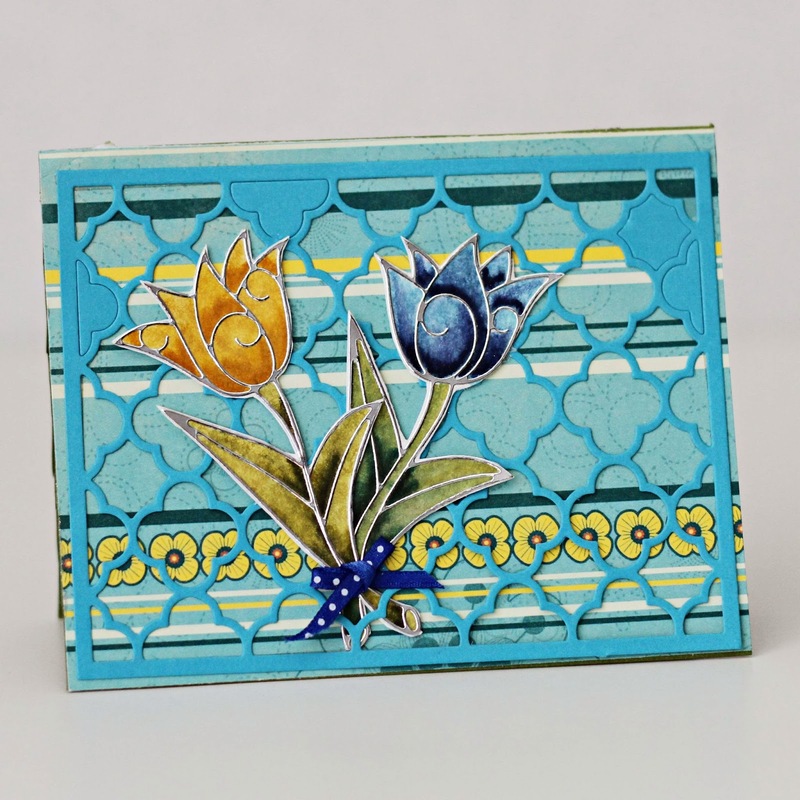 Well, look no further than Taylored Expressions Quatrefoil Cutting Plate. This cutting plate can be used as either an overlay or a showcase piece for your card...or as an accent element on your layout. 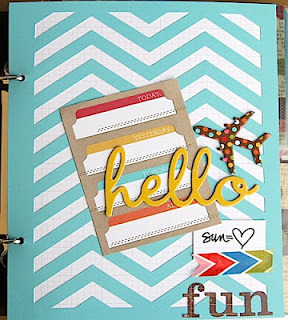 You can leave some of the openings empty which allows the pattern paper design to show through or you can randomly cover some of the openings for a unique look. Look at the 2 examples below for some inspiration. The copic coloured images are from Elizabeth Craft Designs. These items can be found in the Scrap Shotz online store - if you need some assistance, do not hesitate to drop Sandy an email. Remember when you were younger and would look at the Christmas displays through the windows and dream about what Santa would bring? 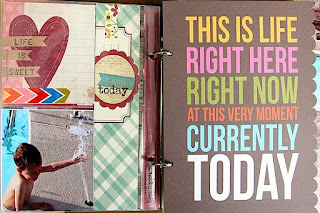 Well this fabulous Arched Window die and stamp set from Taylored Expressions captures that feeling. This Taylored Expressions die and stamp set is uber versatile - you can use these products not just for cards but also for scrapbooking. Wouldn't it just be darling to have a photo behind the window? I also wanted to let you know that there is a companion die set to the Arched Window die set - it is called Window Accessories. You can add shutters or a flower box too - its just darling. Check everything out in the store and if it isn't in stock, Sandy can easily hook you up! Happy Birthday to You....Happy Birthday to You... who wouldn't have a smile on their face with a fabulous birthday card made with the Taylored Expressions Party Banner cutting plate??? This cutting plate makes birthday cards so so so easy to make. It is really one roll through your die cutter and placed as an overlay on another piece of paper. 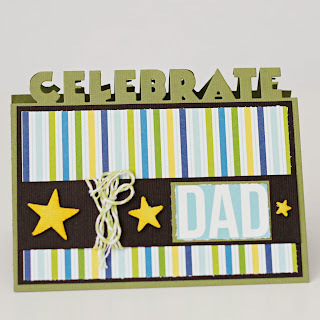 You can embellish it by layering the banners or you can go simply and let the beauty of the cutting plate stand alone. Have you added a Taylored Expression product to your stash? You can find many of her products in the store. 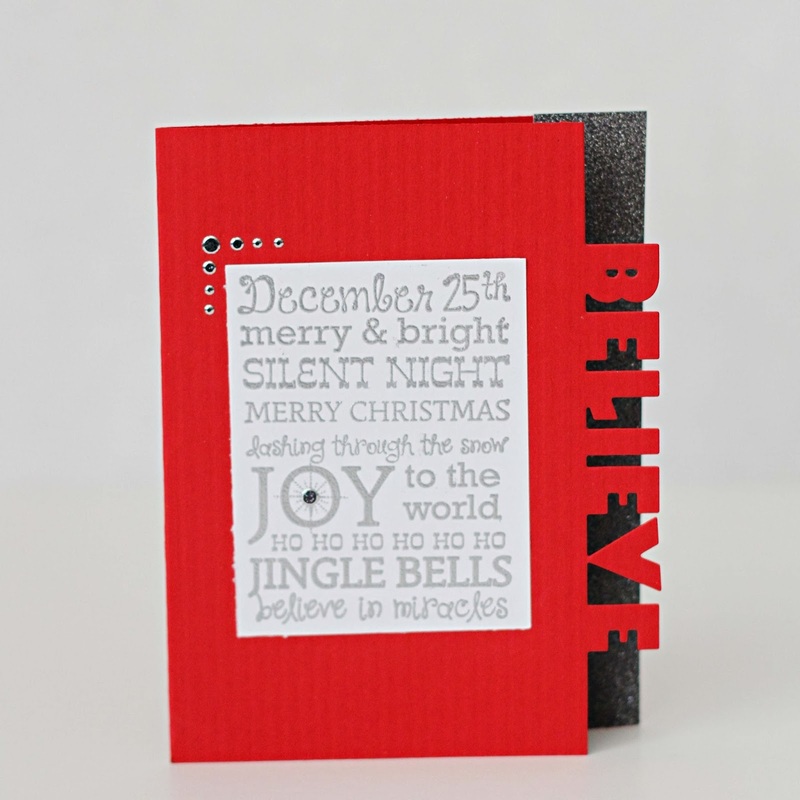 Many cardmakers are eagerly working to finish their Christmas cards these days. 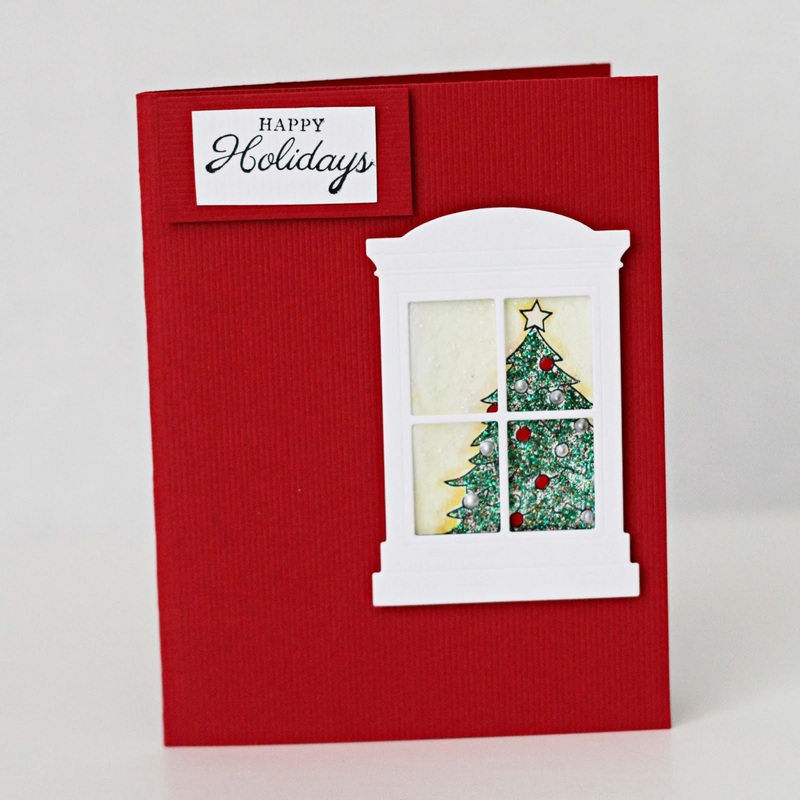 Elizabeth Craft Designs has a few beautiful dies that would be perfect for Christmas cards as well as future all occasion projects. For example, look at the branch and pine cone die below. 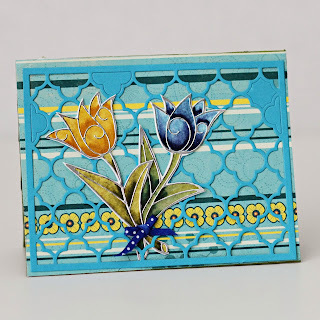 Here is Elizabeth's ornament die - I love the beautiful filigree overlay for the ornaments - its beautiful and so easy to use either as is or all dolled up. 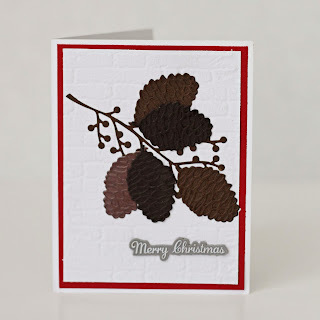 How are your Christmas cards coming along? I ummm have quite a few more to make! 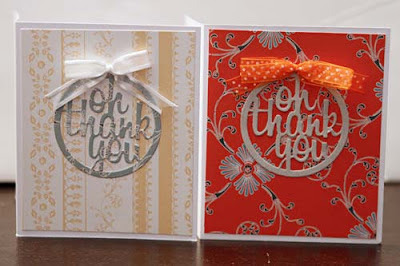 Have you ever drooled over some gorgeous flip cards...and wondered how they were created? 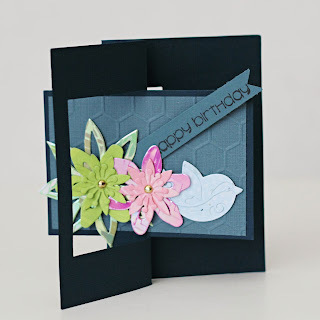 Well, wonder no more because Stephanie Barnard has created a fabulous die that creates the flip card. Below are examples from Rosie and myself. These wonderful dies work in the Big Shotz, Cuttlebug and other die cutting machines beautifully - let me know what you think too! 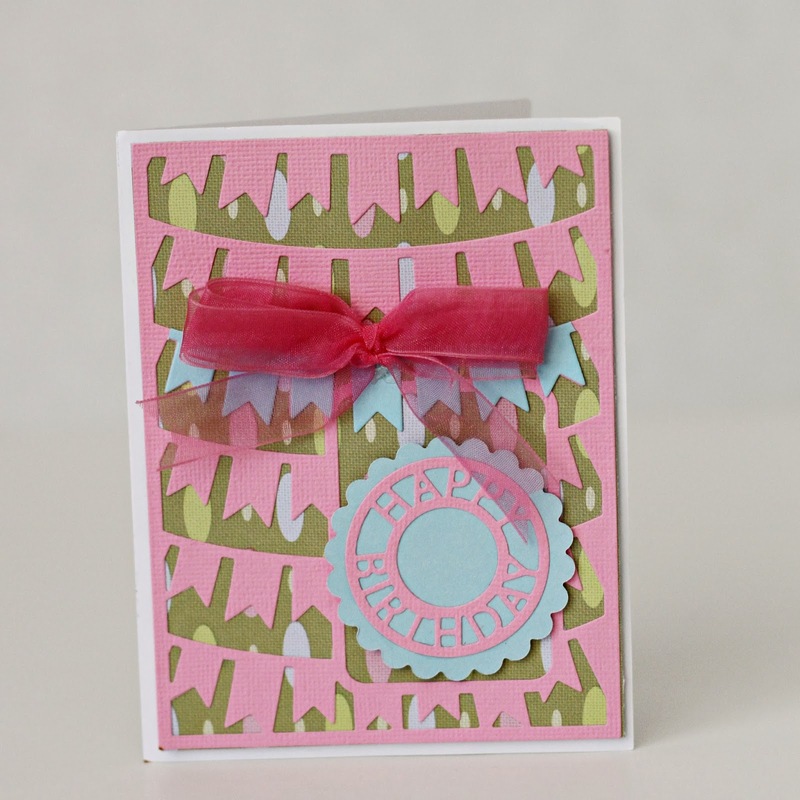 As my title suggests...as an A SIDE...aren't these just the cutest cards ever??? I am in love with the Die-Versions Edges dies. The dies allow you to die cut on an edge. 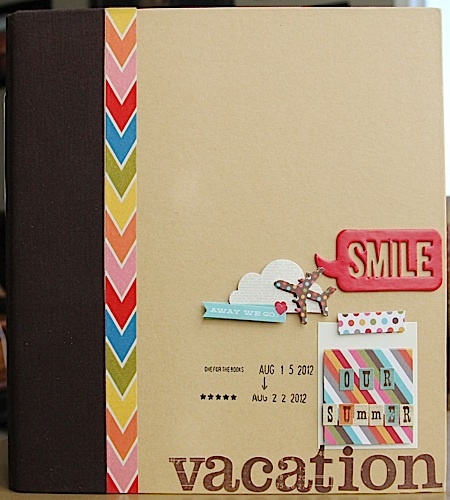 How often have you wanted to add a die cut word or phrase on the edge of a project but were not sure how to do it...well, these dies do it all. They are simple to use, are gorgeous in design and cut beautifully. 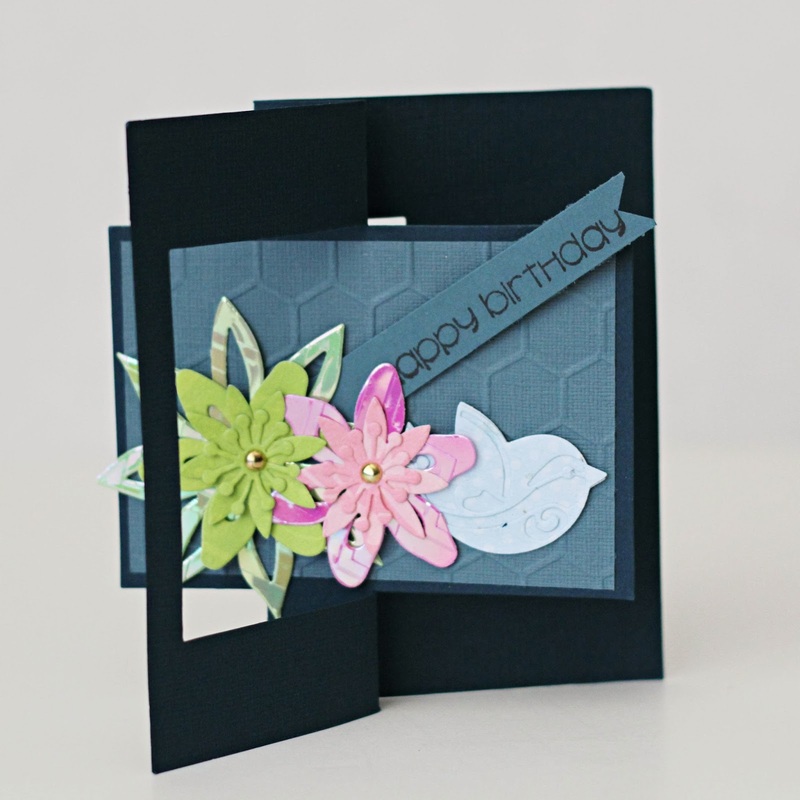 Check out the cards below created by the lovely Rosie! Thanks for dropping by! 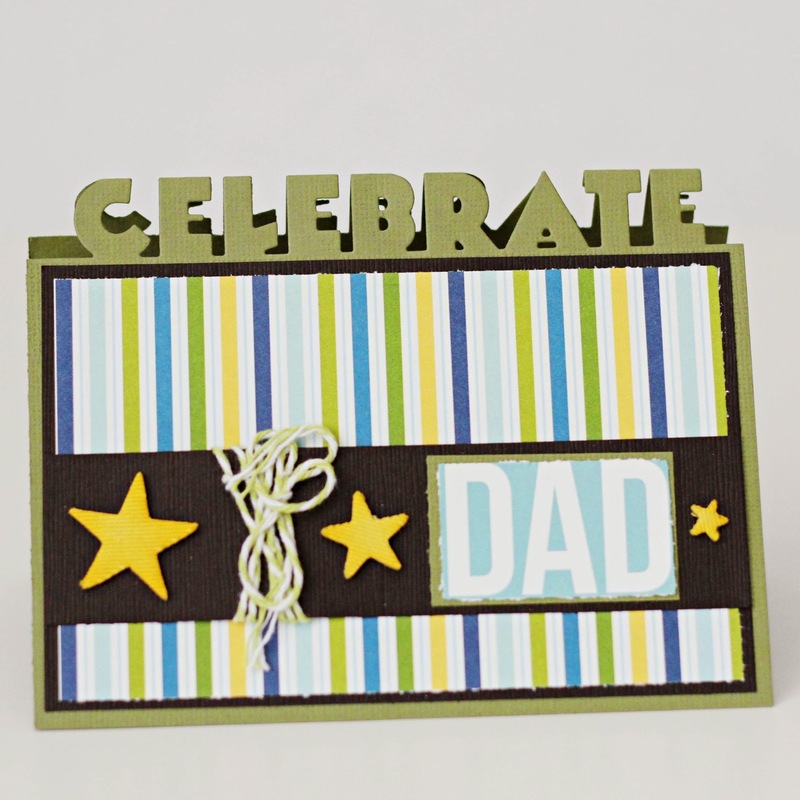 We hope you had a lovely time at our World Cardnaking Day Mini-Crop. 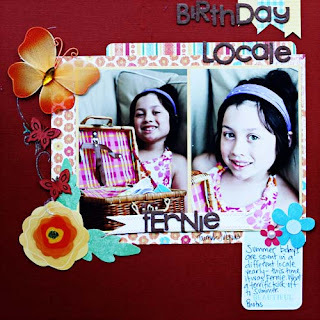 Throughout the summer I have been challenging myself to use my Scrap Shotz kit remnants and collection scraps to their fullest extent. When I scrap, I am a paper heavy scrapper so to have remnants is a bit of rarity...but no matter how frugal I make my cuts, I will inevitably have a few strips here and there. So what do I do with them? 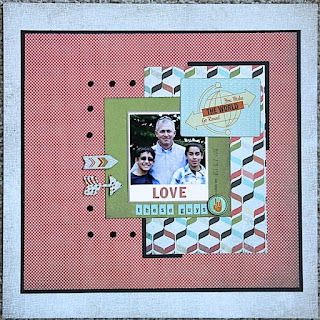 Well, here is an option...use them to create a unique photo mat and create a platform for larger accents. To create added textures and interest on my layout which I would normally do with pattern paper, I used various accents from my stash...to take the place of the "O"s I did not have for the title and to balance the layout. For my layouts, there are bits and pieces of symbolism like the heart to show the love between sisters, the clock to symbolize the passage of time, to the butterflies flitting their wings as they grow and to the dressmakers mannequin they each have in their room to hang their jewellery. I hope you are feeling inspired from this post! Have you seen the Elizabeth Craft Shimmer Sheetz? They are absolutely gorgeous in every way - the colours, the unique texture, the versatility...but one thing I found frustrating was how to cut the Sheetz? At the NSD crop, Rosie helped me shim and shim and muscle my way through cutting the Sheetz. I will be honest - I found it utterly frustrating. What in the world was I doing wrong with my sandwich on my Big Shot? I had searched the web, watched countless YouTube videos but nothing seemed to help. Below you can see Rosie ran into the same problem as I did - how can we cleanly cut the Sheetz? Firstly rather than letting frustration get the better of her, Rosie created these beautiful cards with the "embossed" Sheetz. Aren't they gorgeous??? 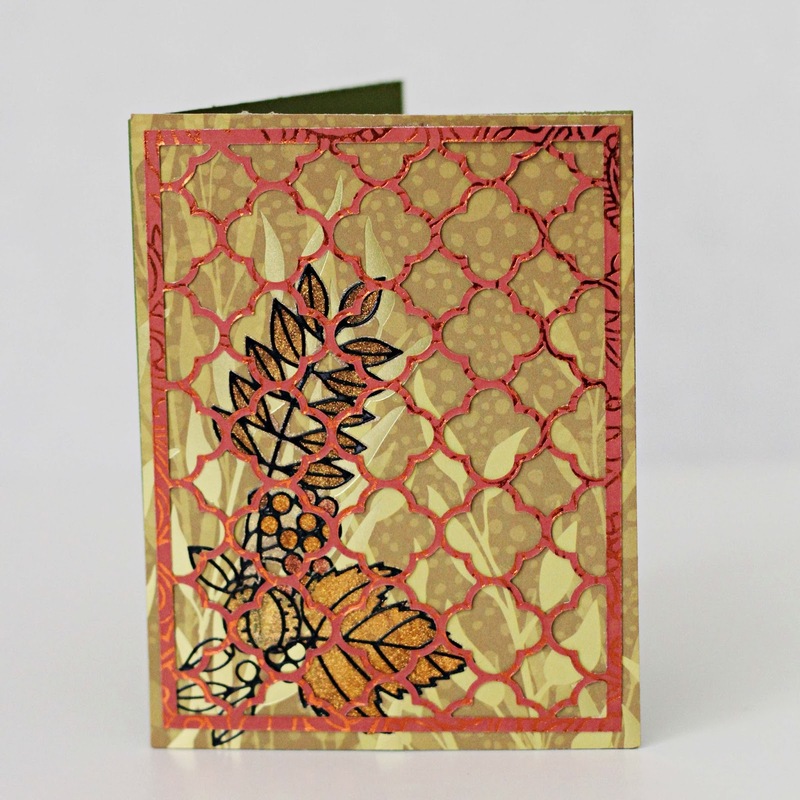 Thank you Rosie for your gorgeous cards and contribution to the Fabulous Fundamental! Fabulous Fundamental: The Who? The When? The Where? Do you look back at your layouts that you have lovingly scrapped? I don't always look back but my family especially my kids love looking and reading the layouts. The two most asked questions I receive are..."Who is that in this picture?" and "When was this picture taken?" Do you get asked these questions too??? 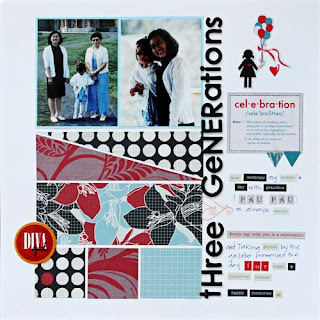 I always thought I would remember every detail of my girls' lives - their adventures, their foibles and their annoyances but....as I scrap my older images this summer it is very apparent I do not remember everything. So now when I scrap I make a point of including the names of everyone in the picture, not necessarily on the front of the layout as I will note the individuals on the back of the layout, when the photo was taken and the location of the image. Sure there are lots of times when I do not know where exactly the shot was taken but I will try to include the city at the very least. When I look back at the few layouts I have created, it gives me a wonderful anthology of our lives. Years from now, I hope it creates a succinct timeline for my ancestors and poignant memories for my daughters. So what are your thoughts on including these extra details??? I would love to hear from you! 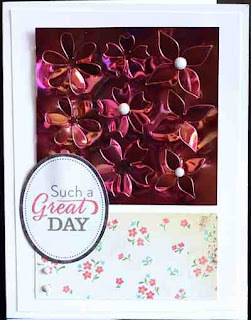 As you know I regularly like to inspire you all with how you can make the most of your supplies...and the Scrap Shotz monthly kit (which is always chockful of goodness!) I love the challenge of seeing how many layouts (or cards or projects) I can create with my kit. 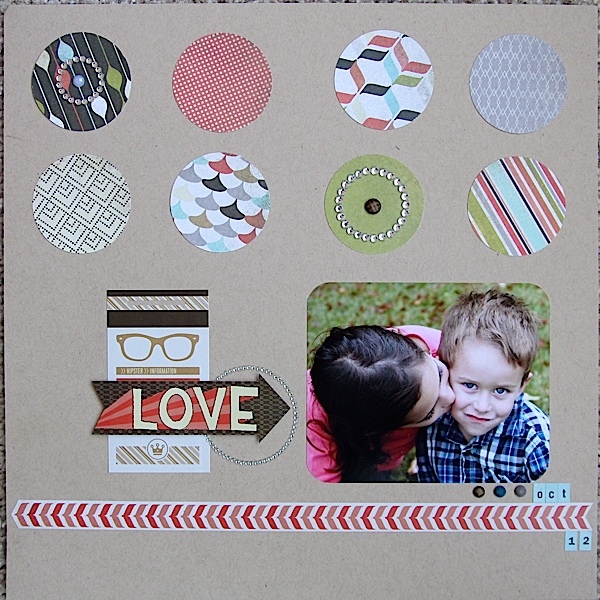 Below is a layout with my kit scraps - I can truly say that this layout is created from scraps. What isn't clear in the image is that I pieced together my pattern paper blocks to look like 4x4 pattern paper squares. Where the seam is I have covered it with accents such as the accordion flower, journalling tag and the title. Even the "banner" at the bottom of the layout is created from tiny strips of paper left over from piecing together my pattern paper blocks. I hope I have inspired you to create with your offcuts today! Drop me a comment and let me know how many projects you can create with your kit. Did you ever imagine completing a 2 page layout in 30 minutes or less? 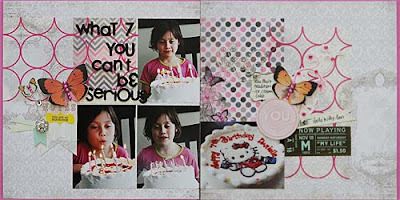 Yeah, I didn't think I could do it either but I thought it would be fun challenging myself :-) Arming myself with photos of my daughter's 7th birthday, some leftover BoBunny papers and some odds and sods, I went to work putting together this 2 page layout. Generally I create significantly more 1-page layouts than I do 2 page layouts but some events lend themselves to 2 page layouts - birthdays are one of them. When I started creating this layout, I knew I wanted some texture and dimension, both of which I find easier to achieve on a 1-page layout. However, as you can see, the layout is very simply put together but I also added dimension and texture with the various layers of accents and leftover pieces of paper I had. Best of all? It was done in under 30 minutes...well barely, 28 minutes actually but who's counting? 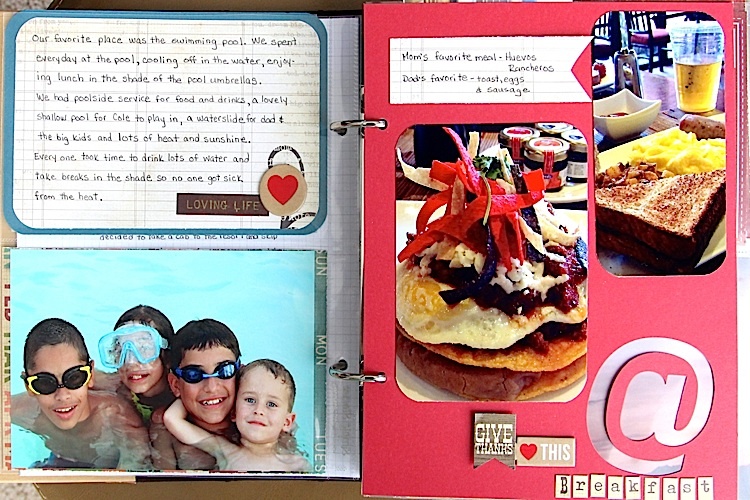 I hope I have inspired you to create a 2-page layout in the near future! Do you own a bounty of flowers? No one was more shocked than I when I opened a drawer and found a plastic container stuffed to the brim with flowers! Well that was just the impetus I needed to start using them...but I must admit, I find flowers hard to use. Why? I really don't know but I know I use almost every other accent in my stash before I use flowers on my layouts and cards. 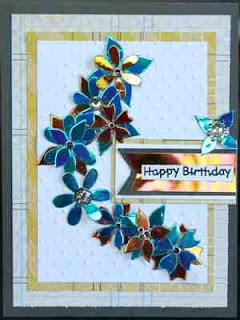 In this layout, I combined flowers from Heidi Swapp, Prima and a ribbon rose from Websters. And if I do say so myself, it looks charming! My flower centres are a combination of pearls from Prima. The chipboard alphas are from Basic Grey. As I did not have alphas all of the same colour, I decided to lightly mist the alphas to even out the colour and draw some continuity between the main title and subtitle. So have I inspired you to use your flowers? Frequently, I challenge myself to utilize as much of my pattern paper as much as possible. That means, I use even those odd shaped and sized scraps leftover from my main projects. 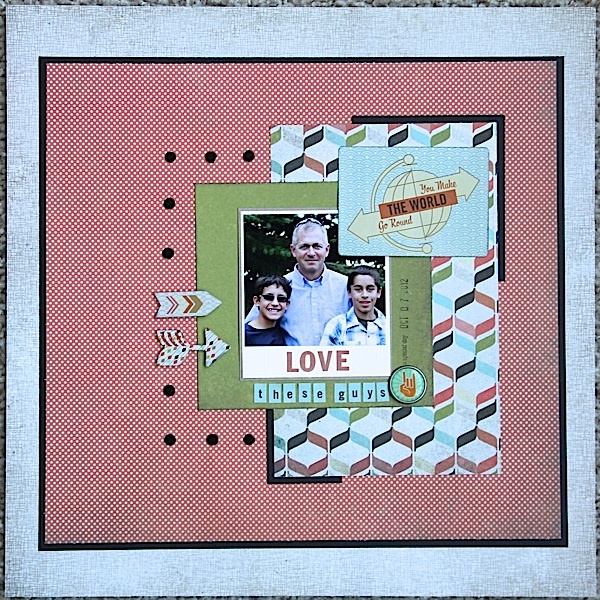 In the layout below, I pieced together my odd shaped and sized pattern paper off cuts into a block that was the same width as my photo block. 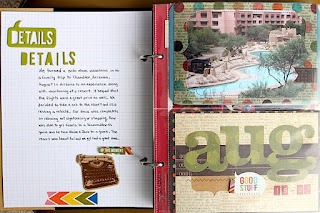 The journaling was created using the mini alphas and word phrases from an Authentique collection - it is not something I would normally do but you know the technique is growing on me and allows me to use my collections to their entirety. 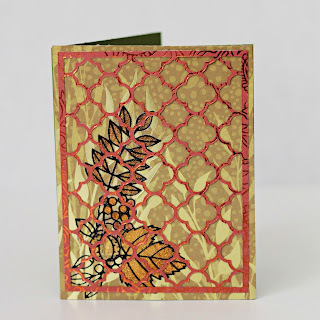 Lastly, I used my remaining scraps of the Kaisercraft pattern paper on the layout below. The strips appear longer than they really are due to how I layered them behind the photos! This again was another 30 minute or less layout! 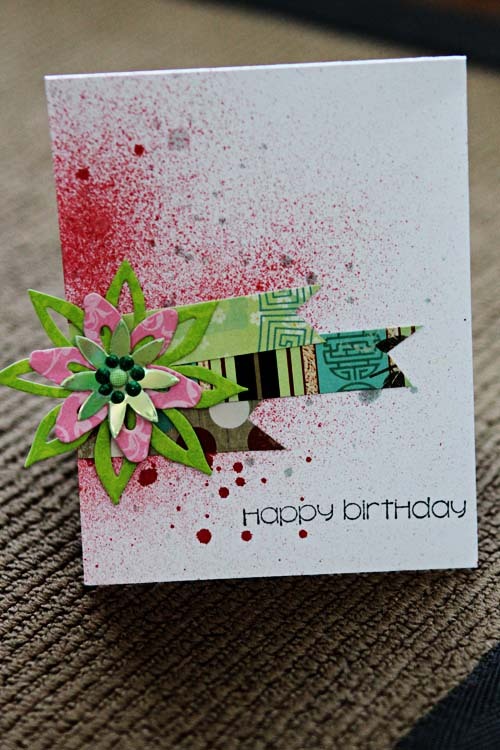 I hope I have inspired you to use your scraps in unique and eye catching ways! In the store, Sandy has been carrying some fabulous products by Art Anthology. At first thought you may think...it looks like another version of a mist or paint or resist media...right? Well, don't let your first impressions give these products an unfair assessment! I would like to share my thoughts and experiences with you on these products. Let me start with the mists...they come in a great variety of colours, colours that are different from others currently on the market. As well, I quite like that the mists are in "stainless steel" aerosol cans. When I use the mists, I achieve a nice even fine spray without alot of pumping - this feature I like alot! In the sample card below, I sprayed the card base with Art Anthology mist and then I overlaid the Art Anthology mist with 2 colours from Tattered Angels. As I often overlay and mix colours, I quite like the effect of the different misted textured backgrounds. 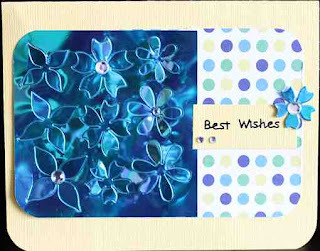 Then using pattern paper scraps from a BoBunny collection, I whipped up the remainder of the card. The butterfly die cut is created by an Elizabeth Craft die and finger painted with Art Anthology Dimensional Glaze. The glaze is a wonderful texture - it's thick without being goopy and is speckled with pieces of glitter. The glaze can also be used as a resist with your mists but in this case, I wanted to quickly "paint" my butterfly die cut. In this sample, the background is again sprayed with Art Anthology mist and overlaid with 2 different colours of Tattered Angels mists. The flower is created by an Elizabeth Craft die and the bottom layer of the flower is an Elizabeth Craft Shimmer Sheetz. I hope you enjoyed this introductory post on the Art Anthology products - in the coming weeks, I am planning to show you other projects enhanced with the fabulous Art Anthology products. Oh me oh my...what do I see in the store that has caught my eye? 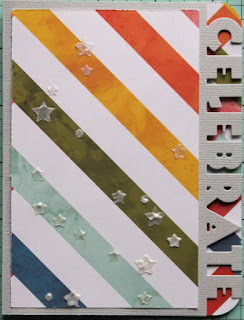 Well, I am loving the American Crafts Zazz glitter glue...and that is big for me as I rarely use stickles or the like but I am loving the glitter. Oh and the colours are dynamite too! I absolutely can't resist the Studio Calico wood veneers. There are oodles of shapes in each package and they are so darn cute! The wood veneers also take on colour well from mists or ink pads or markers...and don't let me forget about stamping on them. Yes I am in serious love with these! 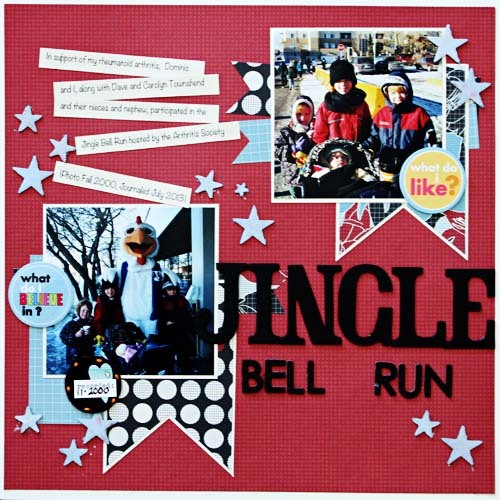 Now I can't talk about wonderful new products without mentioning WRMK Envelope Punch Board. I am so excited to use this new tool but from everything I have read and seen, this board is easy to use and can create beautiful products. 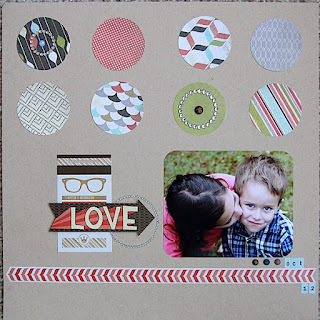 Watch for a blog post soon about the Envelope Punch Board. Everyone here at Scrap Shotz hopes you have had a terrific Canada Day and if you are an American friend, we wish you a wonderful Fourth of July! There are oodles of fabulous products in the store now so watch over the next few weeks for samples of the items. Let me start off with the Die-Versions: Sweet Spot Oh Thank You die. Not only does this die have a super cute font, it is one of the few Thank You dies that I have seen in a circle and cuts like buttah! 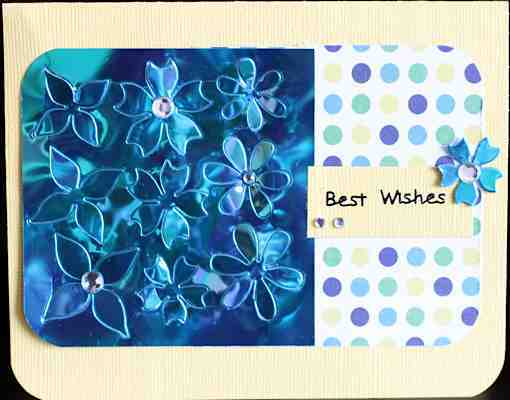 For my samples below, my youngest needed a few thank you cards for a recent birthday. A card doesn't get any easier and faster than this! My thoughts about the die....well this is the second Die-Versions die I have used and I have been thoroughly impressed by how sturdy it is given the "fragility" of the die design. 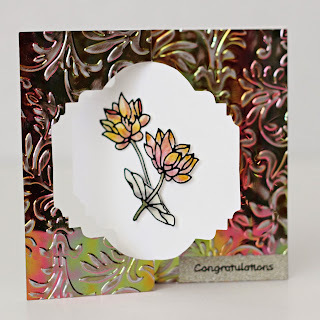 Other dies have I have used in the past with slim and intricate designs have broken or crinkled in my die cutter (yup, I put my products through their paces!) As well, I usually cut 2-3 pieces of cardstock at a time - despite the thickness, each die cut was perfect. However, 3 is the limit! Lastly, the die worked wonderfully on thick cardstock, pattern paper, very light "aluminium" like tin foil and thin very starched fabric - burlap was a bit of a challenge but I think it had to do with my much loved plates than the die...however I will try it again soon! I hope you will give Die-Versions a try! Die-Versions - have you heard of this company? Well, if you haven't you need to seriously look them up! They have some adorable dies. 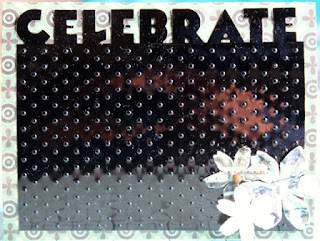 Look at how the "Celebrate" die is used by Rosie below. Aren't these cards adorable? 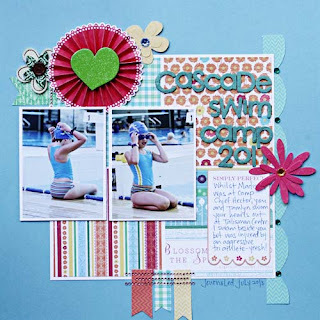 I love this fabulous die! Today I wanted to share a couple of projects I made with leftover Scrap Shotz monthly kit supplies. I personally love the kits Sandy assembles each month, so much so that I am a confirmed Kit Lifer!!! As such I try to use every morsel of product in those kits...and when I get down to the dregs I mix and match. 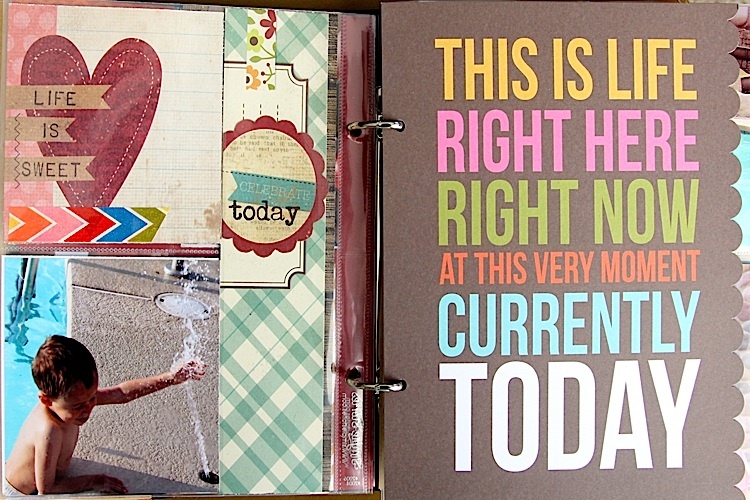 Here are a couple of projects to inspire you. In the first layout, I sprayed the BasicGrey chipboard alphas with some Art Anthology to even out the white and pink alphas. (I will be doing a future post on the Art Anthology products). The remainder of the products on this page came from the odds and sods I found lying on my desk and hidden in my offcuts bin! And best of all with the craziness of June, this took 30 minutes from start to finish! This layout was also a 30 minutes event. I used all bits and I mean bits of pattern paper from a long ago Jillibean Soup and Little Yellow Bicycle Scrap Shotz monthly kit! So I hope this has inspired you and that you know...no piece of paper is too small to create something beautiful! BasicGrey, in my opinion, has always been a favorite. I love their fresh colours and patterns as well as their innovative accessories. 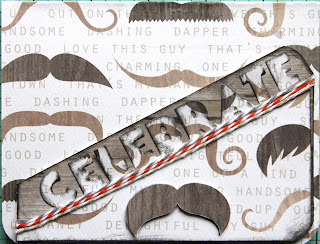 One of their newest releases is Hipster, currently available in the store. This line is fresh, versatile...and tres chic! 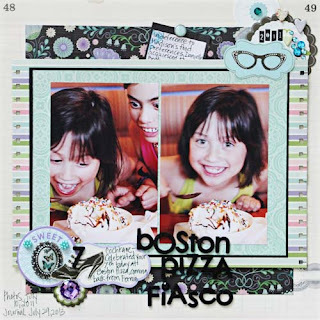 Check out the projects Rosie made with Hipster below! Thank you Rosie for sharing your beautiful projects! Today I wanted to share with you the fabulous SN@P album Rosie created of their vacation. 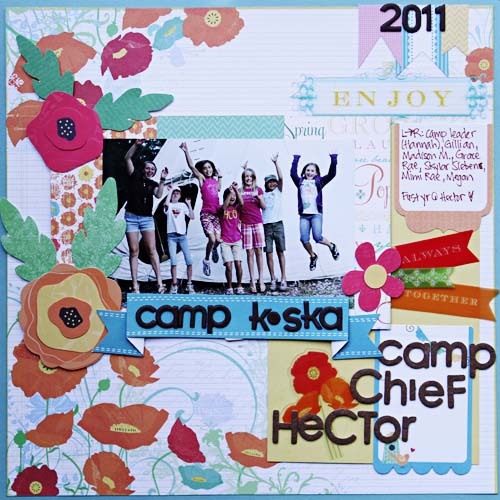 This album features products from Simple Stories - all available in the store! 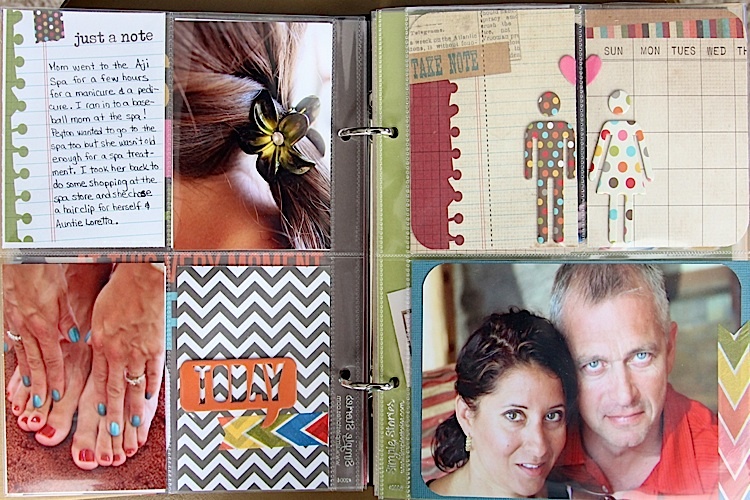 What have you created with your SN@P album?